It’s fall in the Northern Hemisphere, and that means it’s time for scenic fall drives. In Washington State, I have three favorite fall drives that are perfect for a fall road trip or a getaway. And, if you need more inspiration check out my Six Reasons to Visit Washington State in the Fall. My top favorite is the North Cascades Highway, which is the northernmost road in the Cascade Mountains. 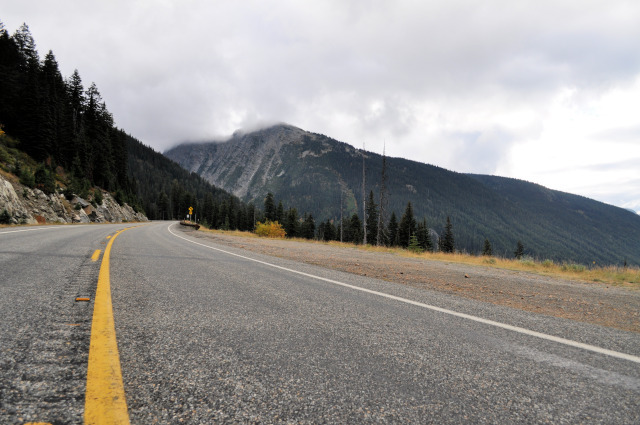 This road is part of the 400-mile Cascade Loop Highway, which goes past a ton of small towns and scenic vistas. If you are coming from Seattle or Vancouver, once you get to Burlington, WA head east on HWY 20. Some points of interest before you get to the mountains is an elk observation area and Wildwood Chapel in Marblemount. Once you pass Marblemount there are no gas stations until you get over the pass an into the Methow Valley, so fill up before you go. It’s also good spot to buy snacks or take a bathroom break. Once you reach Newhalem the ascent into the mountains begins. I recommend getting out in Newhalem to stretch your legs, use the bathroom, buy some fudge at the store, walk across the suspension bridge and snap a photo of the Gorge Powerhouse or enjoy one of the short trails nearby. From Newhalem, it continues up into the mountains, past deep blue lakes, and rocky mountain passes. There will be plenty of pullouts along the way to take in fall foliage along the mountainsides. Be sure to stop at the Lake Diablo Lookout, and at Washington Pass, the highest point on the highway at 5,477 feet. From Burlington, the drive is around 3 hours, and that doesn’t take into account any stops. If you want to make a weekend escape out of the drive, I suggest staying in Twisp or the Old West town of Winthrop. Travel Tip: Once you pass Marblemount there are no gas stations, so fill up before you go. Travel Tip: Along Highway 20 is an elk observation area and in Marblemount is Wildwood Chapel. Travel Tip: This portion of the HWY closes in the winter due to snow. Before you go, check here to see if the road is still open. I drove this 22-mile stretch of road for the first time last fall and it quickly became one of my favorites. The name describes it perfectly for the road meanders through the canyon next to the Yakima River and along the way you’ll see golden hills, trees near the river changing color, cactus, sagebrush, and basalt cliffs. You can catch the road from Interstate 82 after Ellensburg or Selah. There are no services en route so be sure to fill up with gas before you go. In the fall, you won’t see much else, except for some campers and hikers and wildlife. During the warmer months, you’ll see rafters, inner tubers, and fly fisherman. There are pullouts along the road and hikes, and if you hit the trails, be rattlesnake aware. If you want to stay near the scenic byway, I suggest Ellensburg, Yakima, or Zillah. Travel Tip: Fill up with gas before you embark on the byway. Travel Tip: Along the road, there will be pullouts and places to take in the view or go for a hike. Travel Tip: Eastern Washington is rattlesnake country so be snake aware. My last favorite stretch doesn’t have a name, but it’s part of HWY 101 between Raymond and Long Beach, WA. The 40-mile stretch of road goes along the edge of Willapa Bay and passes through several nature preserves – Bone River, Niawiakum, and Willapa. The drive is around one hour and the times I’ve driven it; it has been a little rainy with lots of birds and fog along the bay. If you want to stay nearby, I’d suggest Raymond and Long Beach. Travel Tip: I’m prone to motion sickness and have experienced it on this road. If you are sensitive you might want to take Dramamine before you hit the road. These are my three favorite scenic fall drives in Washington State. Have you driven any of these scenic roads? I’ve been to all three! Fantastic choices! Taking drives to go see the fall foliage is one of my favorite things to do here in West Virginia. 🙂 It looks like Washington state is just as breathtaking in the fall. Carrie, Fall foliage on the East Coast is so beautiful. You are a lucky lady to live with all that color! Great choices. I like the Yakima River Canyon Scenic Byway best. That cactus picture is bizarre but stunning! Melody, I thought that was a very interesting cactus too. Had never seen one like that. I have not yet visited Washington state. I am amazed by the wet/dry contrasts of the landscapes. Yakima River Canyon reminds me of high desert Colorado. I love the wetlands and mountains, too though. Your photos are beautiful. We hope to visit before too long. Elaine, One of the things I really like about WA State is that it has such a diverse landscape with mountains and lush forests and plains with desert vegetation. I hope you get to visit soon and experience both! Helene, I hope you get to do a WA road trip soon. It’s such a great road tripping state. Clearly it is time for me to visit the great state of Washington! Living in Texas, I miss the changing of the leaves. It is usually the simple visual pleasures that we miss most from certain regions of the US. Oh how I miss the NE. Jing, I think you’d like it as it would be such a different experience for you. Thanks so much for commenting! These look like some great drives. I did a road trip through the US and did quite a few national parks and some of the drives were stunning. I would love to get back there and see more, especially in the fall. Clare, I spent many a summer camping in our National Parks. There are some very scenic drives, some a little nail biting too. I hope you get to come back to the US soon! Fall sounds like a beautiful time to visit Washington! Usually the East coast is more known for its fall roadtrips, but Washington may be a better place to go, so you don’t have to deal with all that tourist traffic! Brianna, I would love to visit the East Coast for a fall road trip, but I wouldn’t be into the traffic either. I hope you get to visit WA soon! I’d love to drive down North Cascades Highway! I’m such a sucker for lakes (probably since I live right by one of the great lakes haha), and I think it’d be so cool to see stop off to see the elk too! Miranda, If you love lakes then that is the drive for you. The color of the water is such an interesting blue color, it’s almost surreal. Three beautiful drives in Washington State. I think my favourite would be North Cascades Highway, the photos from there are gorgeous! Fall is such a pretty time to take in beautiful scenery from inside a car. Were you at TBEX by the way? I thought I saw a girl who looks like your photo! Christine, Yes! I was at TBEX. 🙂 Loved touring Ireland for 10 days. Sorry we missed each other. The North Cascades Highway is a great drive. The scenery and the colors are jaw dropping. These are terrific. Don’t forget the incredible drive and stunning scenery of SR 155 from Grand Coulee Dam down Banks Lake by Steamboat Rock SP (lots of hiking, fishing, and swimming), then hang a right on Hwy 17 and continue down through Sun Lakes and Dry Falls SP on down to Soap Lake with fabulous viewpoints of the old riverbed the Columbia abandoned after the Ice Age. Soap Lake has cool little B & Bs and kitschy small town charm. Laurie, I’ll have to look at a map and see if we’ve done that one! Thanks for the tip!